Users can now select one or more reports and/or images from Order History and download to the History Panel. Once in the history panel, user can request additional images, filter names, and invoke the History Panel print, email and export functionality. 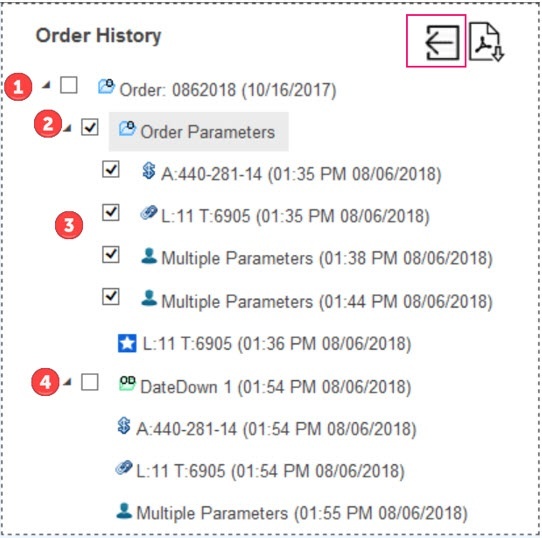 Select the checkbox at the Order level and all reports and images from the Order Parameter and Datedown folder will be selected. Select the checkbox at the Order Parameters folder level and all reports and images in the folder will be selected. Select the checkbox for an individual report and/or image and only the desired report and/or image will be selected. Select the checkbox for a Datedown report and only the desired Datedown report will be selected. Once desired reports and/or images are selected, click on the download button to send all selected reports and/or images to the history panel. When searching for postings for an individual name where the user is unsure which name is First Name and which name is Last Name, users can select Run Reverse First/Last option. 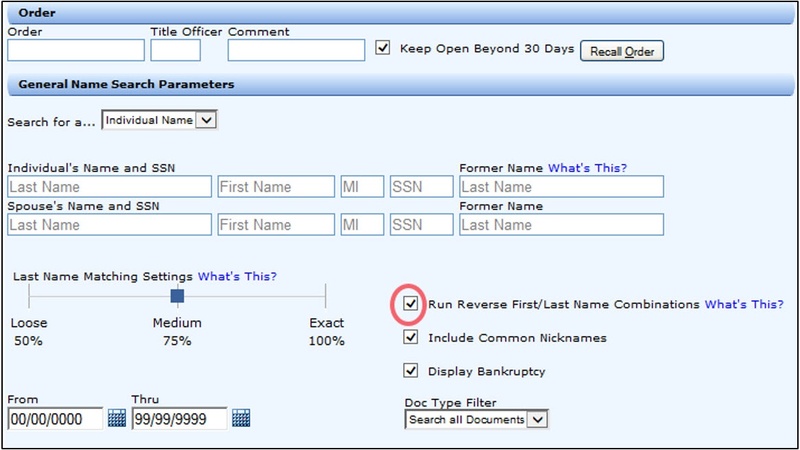 Run Reverse First/Last Name Combinations when checked will search all of the possible permutations of the Last, First and Former Name. If spouse name fields are populated, all combinations of the Spouse Last, First and Former Name will be searched. Douglas, NV Subdivided service now has a Sub Lot from and thru field in order to search timeshare’s. User can search by unit and sub lot. If the specific unit is unknown, run an all lot search (leave lot field blank) and utilize the sub lot from and thru fields to find a range of properties. 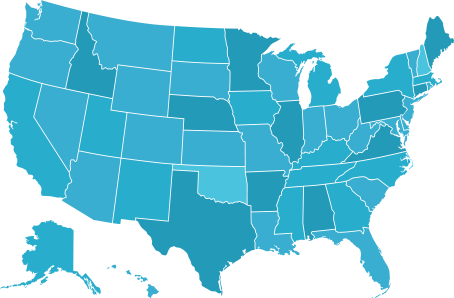 White Pine, NV instrument format has been updated to allow search by Year and Instrument. Reference and Instrument services now have the ability to search by Book/Page, Fee and Year/Instrument. Users can now manage the associated documents for a category at search time when they are desiring to limit the property or name search results by category. This enhancement is for Texas counties only at this time. When a property or name is searched with the results limited by category, and one or more of the associated documents are un-selected, the Search Parameters section of the report will display the categories searched and the (Modified) label. If an order was opened, the modified label will display for both the order search results and the datedown search results. 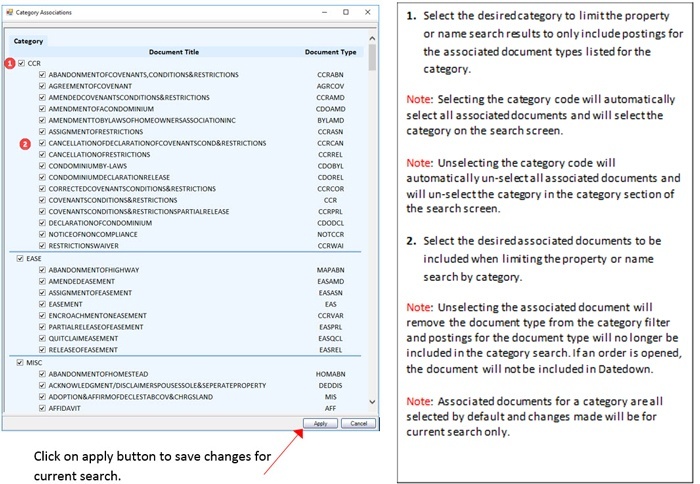 When an order search is submitted for a property or name with the results limited by category and one or more of the associated documents are un-selected, the list of modified associated documents will display in order details for searched order in the Display/Maintain Order service.